The News of the World are this morning reporting that Arsene Wenger has identified Jonathan Woodgate as a possible candidate to solve Arsenal's central defensive shortage. The story is splashed over the back page of their newspaper either as a sign they know the story is true or that it will sell them newspapers. The central defender - who hasn't appeared in the Premier League since November 2009 because of groin problems - is out of contract at the end of the season. He was put through 45 minutes of reserve team football on Tuesday night as Tottenham took on QPR. Whilst Woodgate offers Wenger a cheap option, would the Frenchman really want to raid Tottenham for a player? 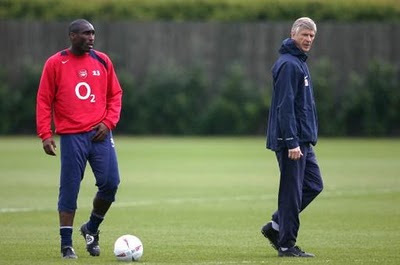 It hasn't stopped him in the past, taking Sol Campbell down the Seven Sisters Road to win trophies in the red half of north London. At 30, Woodgate still has games in him but he would have to prove his fitness and pass a medical at Arsenal. He would provide a cheap option to Gary Cahill, who seems to be the candidate chosen by many newspapers as our prime target. Bolton want silly money for a player they signed for £5 million from Aston Villa three years ago. As I wrote on the blog yesterday, I get the impression from listening to Wenger that he's not going to sign anyone at centre half. I really think he believes we can get through to the end of the season with Djourou, Koscielny, Squillaci and possibly Song playing there. He'll count Thomas Vermaelen "like a new signing" when he eventually returns from injury. Woodgate and Matthew Upson, who has been linked with a move back to the Gunners, offer Wenger the chance to buy someone cheaply with Premier League experience. I'm just not sure he'll do it.